A book by Sri Kota Venkatachalam on the real age of the Mahabharata war. Another book by Sri Kota Venkatachalam which corrects the distortions in the chronology of Kashmir kings introduced by biased Western academics. Another excellent book on our true history by Sri Kota Venkatachalam . Update: Before going through my tutorial I would advise you to try out these three easier and convinient methods for downloading books from DLI. 1.Vinay Shettys DLI book Download Tutorial : This is a simple and easy to understand tutorial.Worked for me perfectly. 2.Ashok Shukla’s ABS DLI Downloader: This is a small piece of good software which allows you to download entire TIFF books from DLI as PDF’s.Unfortunately did not work for me. 3.DLI Downloader from PR Labs :Again a good piece of software,more specifically for Sanskrit documents.Unfortunately did not work for me either. Try all three above,one of them is bound to work for you! Only follow my tutorial if none of the above works! Before we begin a word of thanks to the people behind the Digital library of India (DLI) effort who have taken great pains to digitise and host lakhs of books online. As the books are in TIFF format they are fine for reading online, but the problem starts when you want to download an entire book for reading offline. This tutorial will hopefully address that issue. Here I am assuming that you already the usual stuff needed to browse the internet i.e. Operating system (e.g. Windows) and an internet browser (like Firefox, Internet Explorer). 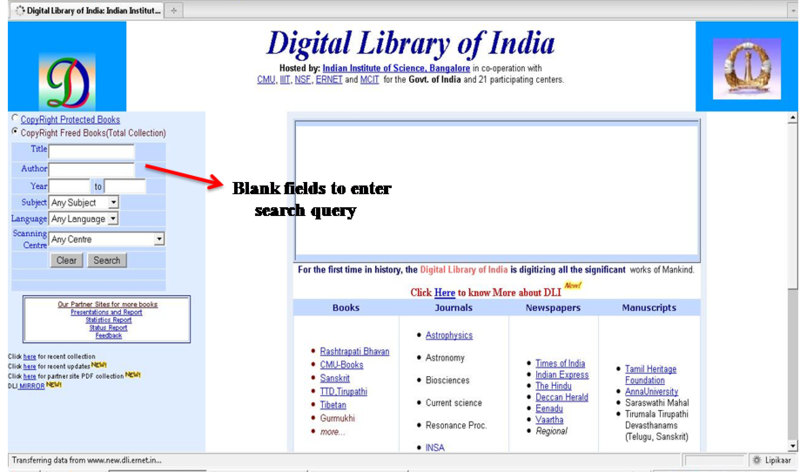 The interface of the DLI website is very simple as seen from the screenshot above. 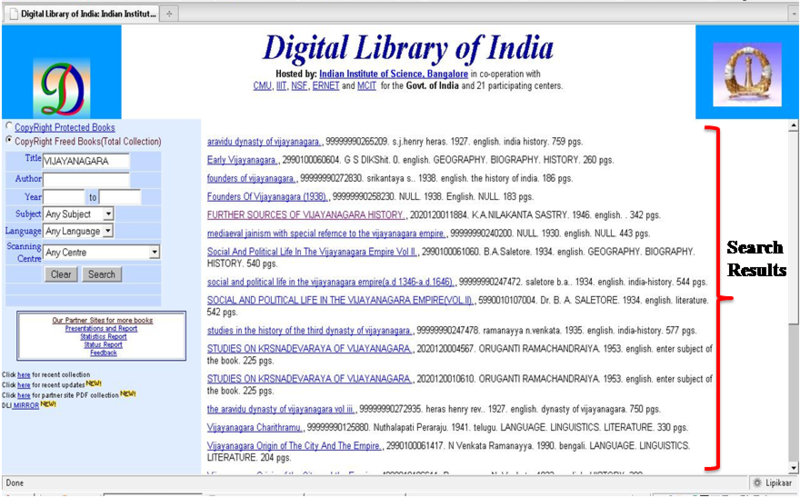 Once you enter the search query, which in my case was for books on Vijayanagar, the results are displayed as in the following screenshot. Once you decide which book you want to convert, click on the book name (which should be highlighted in blue). I usually select “Book Reader 1” but you can go with “Book Reader 2” if you want. The interface is mostly the same in both book readers, they differ only in the way the pages are displayed. On selecting “Book Reader 1” the book reader opens in a new tab/window. The book reader will display the book in TIFF format. The layout of the book reader is pretty simple with buttons to zoom in, save, print etc in the top level strip. In the bottom part you can move ahead or move back through the books pages by clicking on the arrow signs. Step 2: What will I need to have installed to do the conversion from TIFF to PDF? Merge different PDF’s into a single book. Print straight to PDF : A good piece of free software in this category is a software known as “PDF Creator”( found here: http://www.pdfforge.org/pdfcreator). Once you install this software it will show up as a printer when you try to print the TIFF using the print options on the Book Reader. 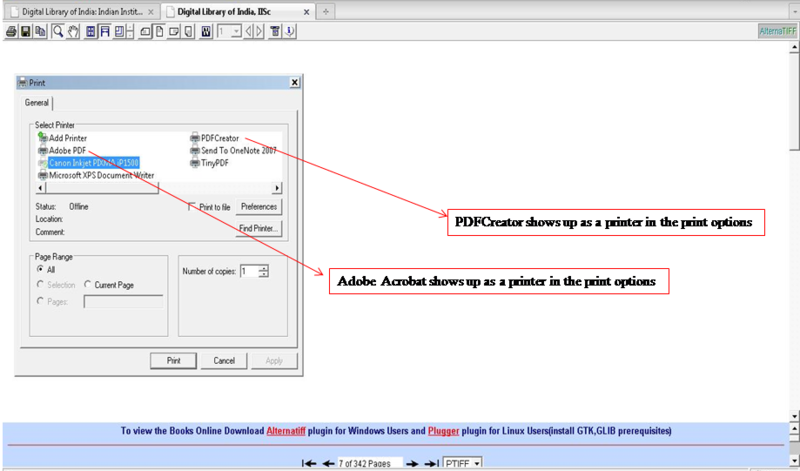 Step 3 : What are the ways to convert the TIFF page to PDF? In the following sections I will describe each of these options in detail. I prefer this method as the BMP image is an exact reproduction of the TIFF page you see on screen. 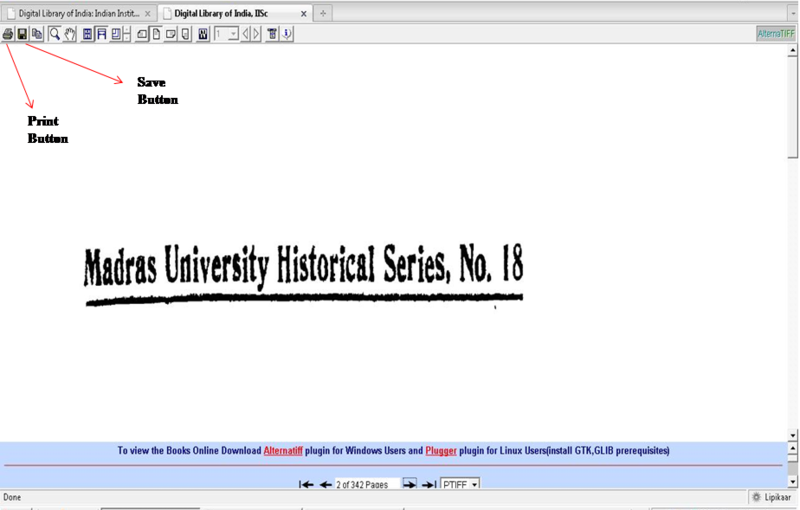 Thus when you convert the BMP to PDF there are no unpleasant surprises in the way the final document looks. You will need to do this for each TIFF page. It would be good practice to number the pages as you save them. This will make life easier when you are converting to PDF and finally combining the PDF’s. 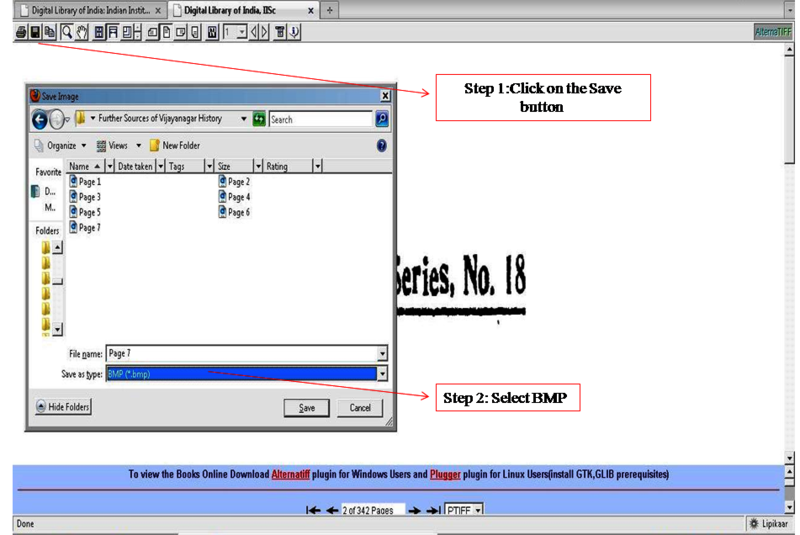 To learn how to convert the BMP images to PDF,you can skip the next part and go straight to Step 4. 2.Print the page as a PDF: In my experience this method can produce variable results especially with regards to the final output PDF. Once installed the PDF software( either Adobe or PDFCreator) will show up as “Printers” in your print options. 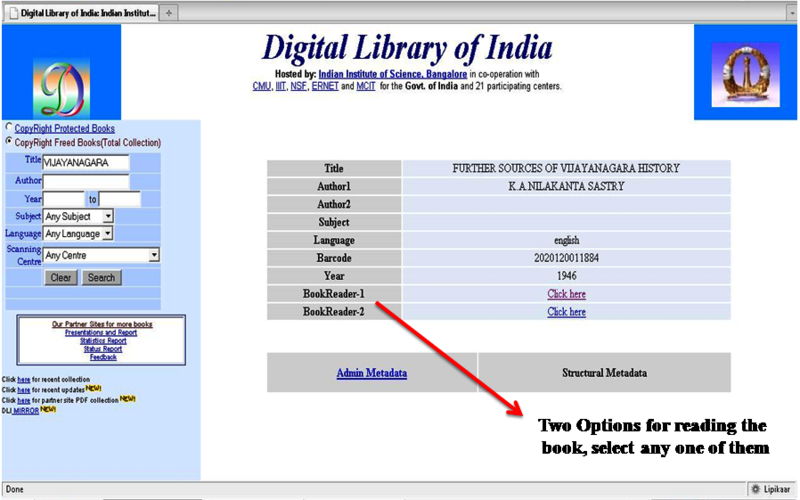 On clicking the Print button at the far left of the book reader interface you will be presented with a list of options similar to the screenshot below. The next step is simple: select the PDF printer you have installed and click on print. Depending on the software you use you will be typically asked to save the PDF in a particular location on your computer. The TIFF page has been converted to PDF format. Now of course you will need to repeat this process for however many pages there are in the ebook. Hey I’ve now got 500 separate PDF/BMP files, how do I combine them into one single book? Select all the different PDF’s/BMP’s in whatever folder you have saved them. Use Edit—>Select all. Right click on any of the selected files.On right clicking you will get an option which says “Combine Supported Files in Acrobat”. Click on that option and Adobe will present you with a screen where you can combine, shuffle the order of individual PDF’s/BMP’s and do other good stuff. A word of caution: When you are selecting and combining the PDF/BMP files in Adobe do them in series.eg If there are 200 pages, combine pages 1-9 first, then 10-99,100-200. I’ve found that if you try to select 200 pages in one go and combine them, the order of pages gets messed up. All done! Your PDF ebook is ready to read! This book is a must read for every Indian as it deals with the gross distortions of our history by Western Indologists.Author is Sri Kota Venkatachalam. A good book on the history of the Hoysala dynasty of Karnataka.Found on the digital library of India site.Author is J D M Derrett.